In a few weeks, April showers will arrive to prepare for May flowers. We all know that during this month, perhaps the trendiest – and most practical – item one can carry is an umbrella. The reason is simple: no one likes to get wet. Whether you’re holding it up or hiding it in your purse, umbrellas are the universal solution for surviving the rainy season. Did you know your umbrella can also be used as front door décor? 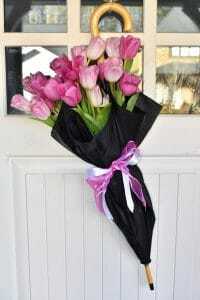 Meet the tulip umbrella wreath. A unique twist to an ordinary wreath, this unconventional floral arrangement will be sure to catch your neighbors’ attention. In a few easy steps, you can create your own to celebrate spring in a creative way! 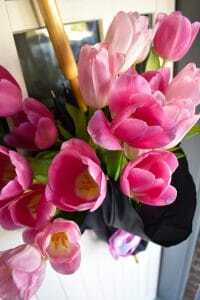 To begin, purchase 20-25 fresh tulip stems in your color of choice and an equivalent number of water tubes. Then, remove any damaged petals or lower leaves before you trim the ends at a slight angle. Fill each water tube three quarters of the way full. Once the lids are securely shut, place one trimmed stem in each tube. 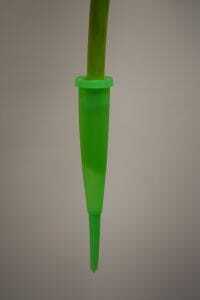 Now you’re ready to place the tulips inside the umbrella. It is helpful to recruit a friend who can assist with the following steps. 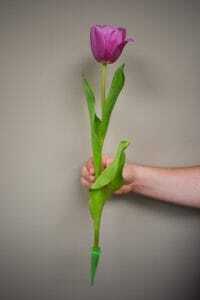 With the handle upward, grab all tulip stems at once and carefully lower them into the front half of the umbrella. 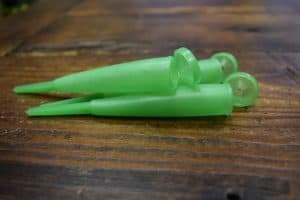 You may have to maneuver the stems before they fit nicely in the bottom. Once the tulips are secure, tie the ribbon around the middle. Finally, hook the umbrella on your front door to hang. Try to keep the tubes upright to prevent leaking. Violà! 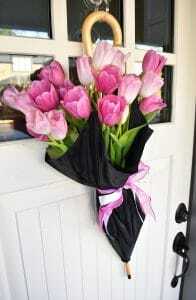 Now you have a simple, yet stunning floral arrangement to decorate your front door. You may even consider this when preparing to host a wedding or baby shower. Regardless of the occasion, if you make one yourself, don’t forget to snap a picture. We’d love to see it!